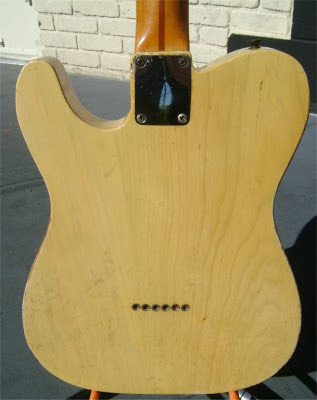 "For Sale is a beautiful 1953, super clean, original "Black Guard" Fender Esquire. It is in fact the nicest sounding and playing Esquire I have ever picked up in my 40+ years of playing and collecting these guitars (yes, I am that old) The guitar comes with it's 50's Tweed case. INCREDIBLY LIGHT @ 6 lbs., 5.7 oz.!!!! And the classic chunky neck to die for! The perfect butterscotch colored body and lightly worn neck are in their original finish and in very clean shape for a guitar of this vintage. The original bridge pickup is really powerful giving you either the classic "Black Guard" Tele twang or it can deliver a perfectly, creamy, raspy, bone crushing, over driven distortion if you get on it! The original bridge pickup could never be duplicated on this thing, it is amazing! The original frets are in perfect condition with very little wear. I doubt this guitar was played with a pic much if at all; as there is none of the classic pic wear on this guitar and the original guard black lights perfectly with only a small area of lacquer wear. It is 100% original with a few minor exceptions. The first 7 frets were pro replaced with original matching fret wire and nut. Small partial route in the neck pickup pocket, replaced capacitors, part of the "Esquire" name on the decal was repaired, and a very tiny touchup on the edge of the neck pocket; I'm assuming someone over torqued a neck screw at some point. These are very small issues and most of them are unnoticeable..."